A dozen cooking class participants were about to dive into their assigned recipes at Richmond Community Kitchen on August 23. 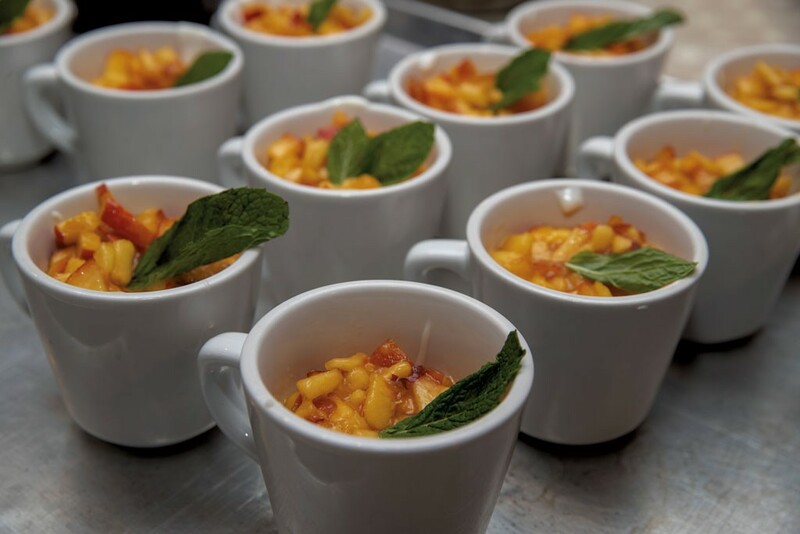 As everyone gathered ingredients and picked up knives, the guest instructor — chef Cara Chigazola Tobin, co-owner of Honey Road restaurant in Burlington — circulated among the worktables, checking in and making suggestions. "Use the large holes on the grater for the zucchini," she recommended to the pair working on zucchini-and-feta-cheese fritters, "and make sure you squeeze it really well to get out as much water as you can." 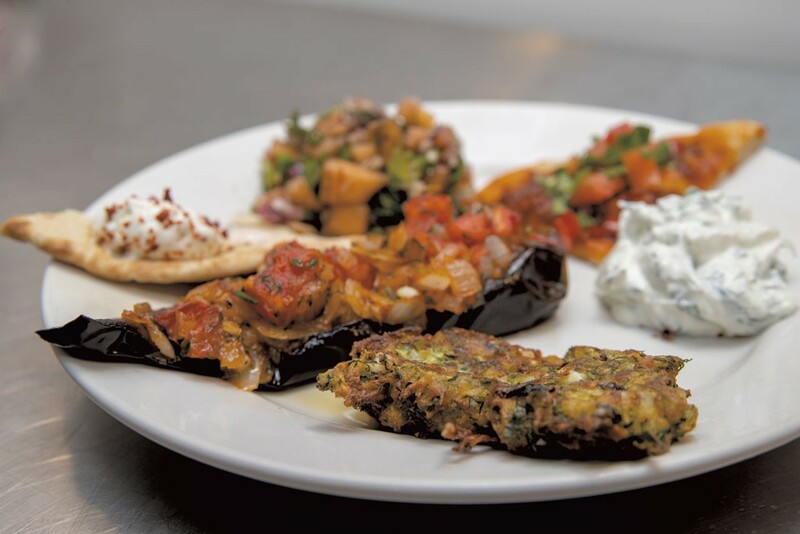 Along with fritters, the menu of Middle Eastern-style shared dishes called "Vermont mezze" included yogurt dips made with green herbs and hot peppers; a salad featuring toasted pita bread, cantaloupe and fennel; tomato- and pepper-topped flatbreads; roasted stuffed eggplant; and milk pudding with peaches and mint. A man and woman peered in through the glass door at all the bustle, and Richmond Community Kitchen executive chef and cofounder Amy Gifford headed over to let them know the business was closed to the public at that time. But after a brief exchange, Gifford led the woman into the space toward a wall lined with freezers, where she selected two of the foil-wrapped meals cooked on-site from primarily local ingredients. Gifford's business partner, Susan Whitman, rang up the sale. "It happens pretty much every day," Gifford said later. "People think we're a restaurant or want to come in and get coffee." Passersby could be forgiven for such a mistake, partly because the former feed store building on Richmond's busy Bridge Street housed restaurants for more than two decades — most recently Sonoma Station — before Gifford and Whitman took it over a year ago. The high-top tables and open kitchen visible through large storefront windows also leave room for interpretation, as does the business name. When the two friends, both Richmond residents, first discussed starting an enterprise together, they briefly flirted with the idea of opening a restaurant down the street in the space now occupied by Hatchet Tap & Table. Whitman, 42, is a certified integrative health coach and licensed physician's assistant; Gifford, 45, worked for 15 years connecting Vermont schools with the local food system. After a year of discussion and two years of testing the locally sourced, prepared-meals concept out of Gifford's house, the business partners are clear about what they are and are not. 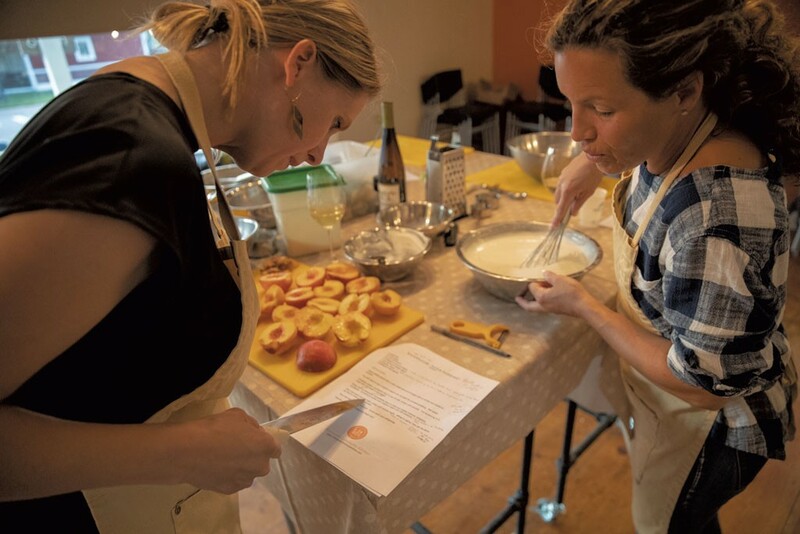 "We know how food nourishes more than the body, and we spent a lot of time thinking about how to connect food and health, the two worlds we're coming from," Gifford said in an interview a few days before the cooking class. "What set of services could we provide that would help people realize their very best relationship with food?" Gifford loves to cook and figure out creative ways to use local ingredients. Whitman admits that, like many people, she finds feeding her family a bit of "drudgery," even though she fully understands the importance of good, wholesome meals. "I think I started this business with Amy so she would cook for me," Whitman joked. "When I think about food and wellness, the easy thing to do is the unhealthy thing," Whitman continued, listing examples like grabbing fast food, or driving to work and school rather than walking or cycling. "People in our community want to support local and they want to feed themselves well, but they'll buy a CSA share and then it rots in the fridge," Gifford elaborated. "Our goal with the prepared foods is to offer healthy meals made with ingredients sourced locally and with integrity, so people can still support local farms." In her brief introduction to the August 23 cooking class, Gifford explained to students that everything she and Whitman do comes back to food's integral role in overall health while also supporting local farms and food producers: "Our mission is to make it easier for everyone to eat well." In addition to keeping the freezers (and one fridge) stocked with a range of items from $6 vegetarian breakfast burritos to a family-size $25 beef-and-kale lasagna, the pair is building a schedule of cooking classes, health coaching groups, and other food- and health-related events. The women also host private parties and rent out the kitchen to local food entrepreneurs. "We are working on all sorts of opportunities [toward our goal] — everything other than being a restaurant," Gifford clarified. The frozen meals are cooked from scratch using 100 percent Vermont-produced proteins, including beans, and about 75 percent local produce and other ingredients. "If we can't source it, we don't make it," Gifford said. The menu varies with the seasons, although Gifford and her one kitchen employee will preserve quite a bit this summer and fall. Some recipes, such as her chicken enchiladas, are nonnegotiable. "If we run out, it's borderline mutiny," she said with a smile. Response to the prepared meals has far exceeded the women's expectations and is the bulk of their business. The mix of classes is evolving in response to customer feedback and differs a bit from what they had originally anticipated. "People are not as interested in ways to get dinner on the table," Gifford said. "They're more interested in the international classes, the ones where someone in our community shares their grandmother's authentic Thai drunken noodles or family recipes for pierogis, Ethiopian or Dominican food." Participants in Chigazola Tobin's sold-out class had each paid $65 for the chance to learn from the James Beard Foundation-recognized chef, who earned a 2018 Northeast semifinalist Best Chef nod. Classes range in price, starting at $40, and more community-based events, such as an upcoming Go-To Weeknight Dinners recipe swap and potluck, are just $10. Richmond Community Kitchen offers a sliding scale for classes and coaching, and a Feed It Forward program supports meal donations to the local food shelf. This fall will bring some free events in partnership with the University of Vermont Medical Center and Hunger Free Vermont outreach programs. 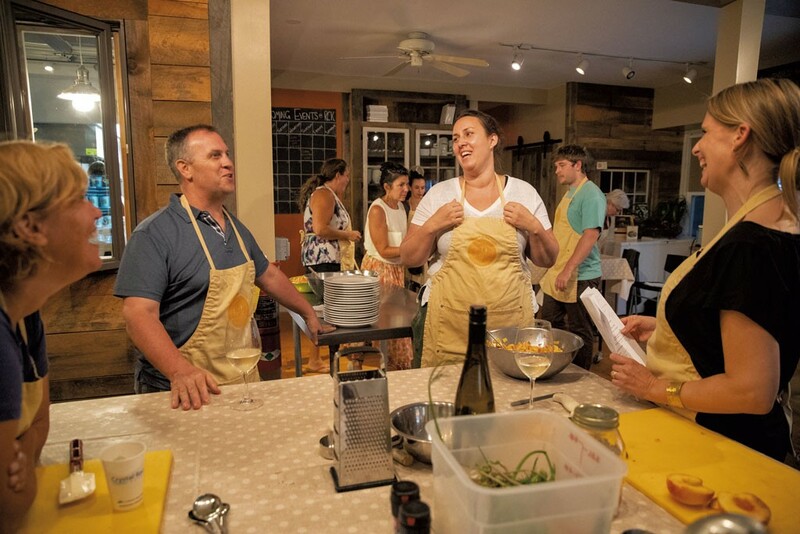 Many in the Vermont mezze class had been drawn by their appreciation of Honey Road; a few were also devoted Richmond Community Kitchen fans looking to expand their cooking horizons. They ranged in age from 23 to 64 and were mostly women, including several pairs of friends sipping BYOB wine as they cooked and chatted. A young couple were attending the class as an anniversary gift. Mike Yaeger of Berlin was among the Honey Road groupies who had heard about the class via Facebook. "It's all vegetarian, so that's even better because I'm vegetarian," he said. "I like to cook, but more, I like to eat." By way of introduction, Chigazola Tobin shared her enthusiasm for the height of local vegetable season. "I love eating a meal of vegetables," she said, "even though I'm not vegetarian." The chef also teaches at Boston University and noted the emphasis most culinary training programs put on meat. "Vegetables are way more complicated than meat," she said. "There are, like, a million different vegetables. Once you master those, then you can move on to meat." Chigazola Tobin also told her own story about finding her professional passion in eastern Mediterranean food. "The way they eat is always family style with lots of shared plates," she said. "You're sitting together, eating together, looking at each other and engaging with everyone. You're part of something. I love that feeling of sharing around the table. That's what I fell in love with." Students called the chef over to ask about unfamiliar ingredients or to check technique. She explained that labne was a form of strained yogurt — "so thick you can stand a spoon up in it" — and passed around a small bowl of sumac. The citrusy dried plant powder is integral to the flavor of many dishes of the region. "You might want to add a little water to the pan," Chigazola Tobin suggested to Amy Guidice of Shelburne, who was cooking down a mixture of onions and red bell peppers to spread over small flatbreads called lamejun. Although a lot was going on to produce the colorful spread of seven dishes, Chigazola Tobin emphasized that they were all relatively simple, selected to showcase what was fresh and in season. She hoped the students would be inspired to make them again to share with friends and family. During her introduction, the chef had described lamejun she had eaten on a small island off the coast of Turkey, where her host had been embarrassed that it was all he had to serve guests. The flatbreads were topped with lamb, Chigazola Tobin recalled, "then he put a dollop of fresh yogurt, a handful of parsley and a squeeze of lemon and rolled it up. It was so simple and so good. It was the most delicious thing I had ever had, the best meal of my life," she said. "And he was apologizing for it." This salad is adapted from chef Cara Chigazola Tobin of Honey Road restaurant. It can be made with all sorts of ingredients, but, explains Chigazola Tobin, the two "must-haves" are toasted pita bread (a great way to use up stale pita or even pita chips) and the citrusy, dried red powder from the fruits of certain varieties of sumac. The recipe can be made without the pomegranate molasses but really needs sumac. Both ingredients are sometimes available at natural foods and specialty markets and were in stock at press time at Healthy Living Market & Café in South Burlington. Heat oven to 350 degrees. In a large serving bowl, toss pita bread in ½ cup olive oil and lay in a single layer on one or more rimmed baking sheets. Bake in oven about 8-10 minutes until golden brown and crisp. Set aside to cool. In the same large serving bowl, toss together the cantaloupe, onion, romaine, fennel and herbs. In a small bowl, make the dressing: Whisk together the lemon juice, honey, sumac, salt and pomegranate molasses, if using. Add pepper to taste. Whisk in remaining ½ cup olive oil. About 5-10 minutes before serving, add toasted pita bread and dressing to cantaloupe mixture and toss. Adjust seasoning to taste. Serves about 6 as a side dish. The original print version of this article was headlined "Eat Well, Be Well"